FINANCE MINISTER MICHAEL Noonan has said that plans to close the loophole allowing companies registered in Ireland to be ‘stateless’ in terms of their residency is aimed at ensuring there is no reputational damage to the country. At a press conference in Government Buildings this evening Noonan acknowledged that Irish corporate tax law has come under scrutiny in a number of recent inquiries, notably a report by a US Senate committee in May which described Ireland as a tax haven. Explaining how the change would work, the Minister said he envisaged that once included in the Finance Bill, that would be passed by Christmas, the new regime would come into force at the beginning of 2015 as companies need an “adjustment time”. He explained that at present under Irish company law “one can incorporate in Ireland but not be tax resident in Ireland or anywhere in the world” which provides “a vehicle for companies if they so wish to channel their worldwide profits through the Irish incorporated company and not have tax residency anywhere”. This will change so as that companies incorporated in Ireland cannot be ‘stateless’. The Minister said that the changes will apply to Apple but also to a small number of other companies. He also said he does not have any concerns about the impact this change will have on foreign direct investment into Ireland or the companies who the new law will affect. “We understand from our sources in the system that it will not lead to any diminution in foreign direct investment flows into Ireland, because it’s something to protect our reputation,” he continued. Noonan also reiterated that Ireland’s sacrosanct corporation tax rate of 12.5 per cent is in accordance with EU law and will not be changed. 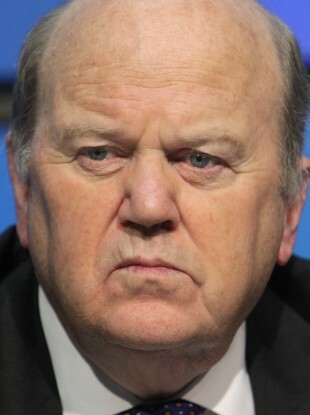 “That’s our business, it can’t be imposed on us, and we’re gonna keep it at 12.5 per cent,” Noonan said adding that he wants Ireland to be “above reproach” when it comes to taxation. Asked was he worried about budget negotiations in Germany, where Ireland’s low corporate tax rate has come up, Noonan played down concerns, saying: “You’d be surprised what comes up when coalitions are being negotiated. Email “'We don’t want to incur any reputational damage': Noonan on 'stateless' companies crackdown”. Feedback on “'We don’t want to incur any reputational damage': Noonan on 'stateless' companies crackdown”.